Ordinance No. Page 8 5. The applicant shall store the vending cart off the City Plaza and shall describe the provisions for storage in the permit application. 6. The applicant has obtained all necessary permits required by the Johnson County Department of Health. The sale or assignment of a mobile vending permit for City Plaza is expressly prohibited. The City reserves the right to revoke a permit as it deems necessary. B. Ambulatory Vendors. 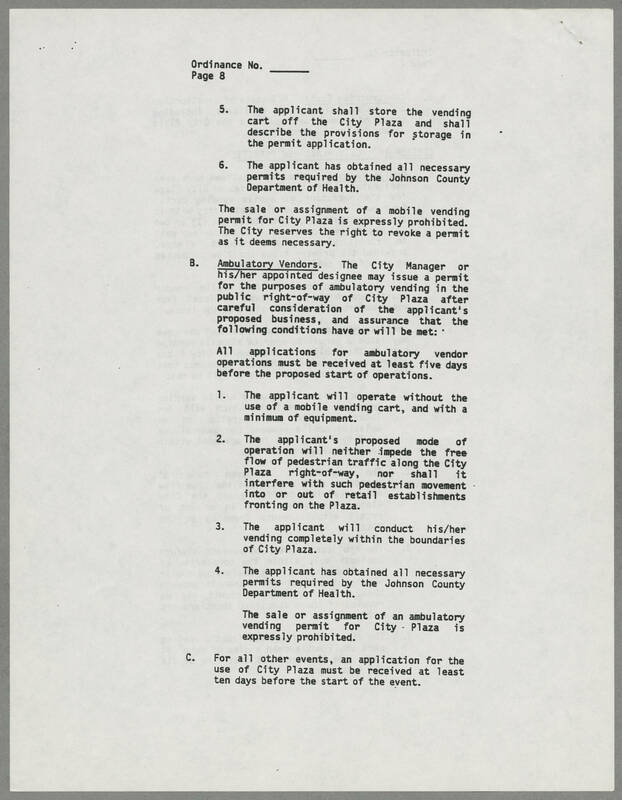 The City Manager or his/her appointed designee may issue a permit for the purposes of ambulatory vending in the public right-of-way of City Plaza after careful consideration of the applicant's proposed business, and assurance that the following conditions have or will be met: All applications for ambulatory vendor operations must be received at least five days before the proposed start of operations. 1. The applicant will operate without the use of mobile vending cart, and with a minimum of equipment. 2. The applicant's proposed mode of operation will neither impede the free flow of pedestrian traffic along the City Plaza right-of-way, nor shall it interfere with such pedestrian movement into or out of retail establishments fronting on the Plaza. 3. The applicant will conduct his/her vending completely within the boundaries of City Plaza 4. The applicant has obtained all necessary permits required by the Johnson County Department of Health. The sale or assignment of an ambulatory vending permit for City Plaza is expressly prohibited. C. For all other events, an application for the use of City Plaza must be received at least ten days before the start of the event.